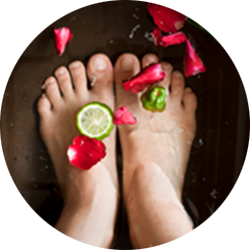 Detoxifying pedicure (approx. 55 min)- balances and detoxifies thick ankles and calves. Feet are exfoliated with sea salt and massaged with algae oil. Tired leg SPA pedicure (approx. 55 min)- balances water retention; energizes tired, swollen feet and stimulates the lymphatic flow.